Engineers at Carnegie Mellon University have been looking closely at creating soft and deformable electronics. In particular Carmel Majidi and James Wissman of the Soft Machines Lab have created an alloy of indium and gallium that is liquid at room temperature. The duo infused this non-toxic alternative to mercury in rubber to make circuits that are both soft and elastic – like skin. In a further interesting development Majidi and Wissman teamed up with Michael Dickey at North Carolina State University. They found that the indium and gallium liquid was good for more than just soft and stretchy circuits. Its properties cold also be harnessed to make liquid metal transistors. As Phys.org succinctly explains, “fluidic transistors work by opening and closing the connection between two liquid metal droplets. 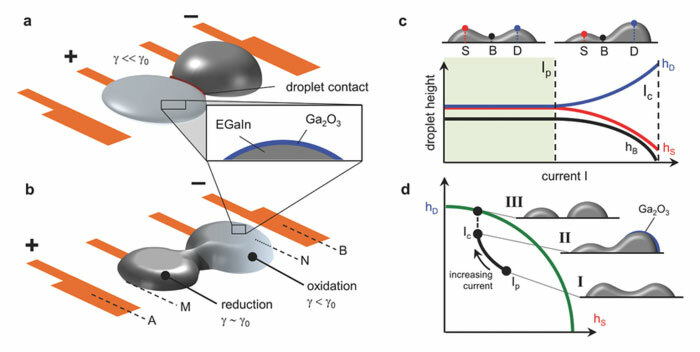 When a voltage drop is applied in one direction, the droplets move towards each other and coalesce to form a metallic bridge for conducting electricity. 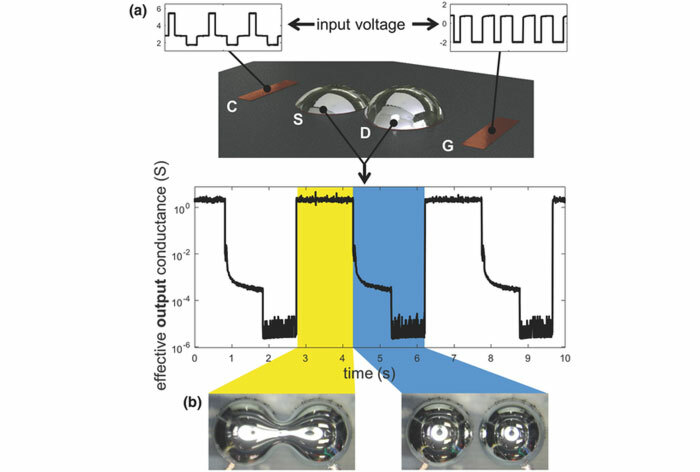 When voltage is applied in a different direction, the droplets spontaneously break apart and turn the switch to open.” Only a small voltage is required to flip the liquid metal between open and closed switch state, so it can operate like a transistor. Behind the behaviour of the liquid indium and gallium alloy is a phenomena called capillary instability. Looking at the potential of the liquid metal transistor the scientists see even more impressive applications. “You could eventually use this effect to create these physically reconfigurable circuits,” thinks Majidi. If the materials can be programmed to change shape, they can potentially change their function depending on their configuration. The engineer goes even further to talk about flying robots deforming circuitry in their wings or reassembling parts that are damaged. To read through the full paper by Wissman, Dickey, and Majidi you can head on over to the Applied Science Journal entry in the Wiley Online Library.